The Q3 report had some good news - strong gas wells in the Netherlands - and some bad news - more delays with Corrib. Production hit an all-time record and is expected to grow ~14% next year, while capex is reduced ~30%. Corrib is ready to go and simply waiting on Irish approval to do so. That's 9,700 boe/d of TTF-priced natural gas (~3x NYMEX). After a big drop in the share price, VET is yielding 6.5%, the dividend is secure, and shares are very attractive. Vermilion Energy (NYSE:VET) is a Canadian based oil and gas E&P company with diversified operations across Canada, Europe, and Australia. The company is poised to have a greater percentage of production from its exposure to relatively high-priced European gas - currently trading at more than 3x the price of North American gas. On that front, management's comments during the Q3 report indicated some good news and some not-so-good news: excellent gas well results in the Netherlands was more than offset by disappointing news that the big Corrib development in Ireland was still offline due to regulatory snags (again). The market appears to doubt Corrib will ever come online, and this could well make VET a very enticing investment opportunity. First, the not-so-good news. The Corrib gas project in Ireland, of which VET owns an 18.5% stake along with partners StatOil (NYSE:STO) and operator Shell (NYSE:RDS.A), is still waiting for the Irish government approval to come online. 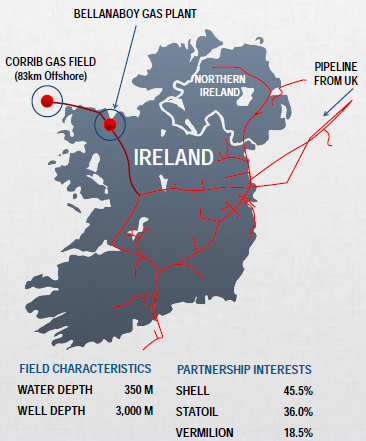 At full production (~9,700 boe/d net to Vermilion), Corrib is expected to provide 60-65% of Ireland's gas needs. "We continue to expect that the required consent will be received in the coming weeks, with first gas production to follow shortly thereafter. Following startup, production levels at Corrib are expected to rise over a period of around six months to a peak rate of approximately 58 million a day or 9,700 BOEs a day net to Vermilion by mid-2016." While that sounds hopeful, considering the much later-than-expected start as compared to management's guidance earlier this year, investors have to take these comments with a grain of salt. That said, obviously the project is poised to begin first gas as soon as a piece of paper is signed by the Irish regulators. One would think the approval would come sooner rather than later considering Ireland will be able to substantially reduce natural gas imports once Corrib is online. As I estimated in my last article on VET (Vermilion Energy: Euro Gas Business a Growing Pillar of Strength), at 58 mmcf/day net to the company, and subtracting an estimated $1/mmcf for taxes and pipeline transport overhead (very conservative), VET will still realize an estimated US$486,000/day from Corrib at peak production. That works out to $177.7 million US$ on an annual basis. Compared to the company's Q3 revenues of $245 million, Corrib could contribute to an estimated 18% increase in annual revenue - approximately $1.56/share. That's huge. But this is talk until the project goes online and ramps up to peak production as expected. As a battered shareholder, I am eagerly awaiting the press release announcing that Corrib is in-service. In the big picture, a 6-month delay on a project of this magnitude for VET - one that is expected to have field life of 15-20 years - is really not that big a deal. However, in the low commodity price environment, the market has treated shares with much disrespect for the delay. Offsetting continuing Corrib delays were excellent well results from the Netherlands that led to record quarterly production of 56,280 boe/d in Q3. Two wells in the Netherlands (Slootdorp-06/07 - 92.8% WI) were placed on production for an extended test. The two wells, drilled in Q2, contributed ~24 mmcf/d (4,000 boe/d) to the quarter's average production rate. These are very strong wells. The Diever-02 exploration well (45% WI), drilled in 2014, came on production in early November for an extended production test at a gross rate of 28.5 mmcf/d (4,750 boe/d). While this is also a very strong well, because of current pipeline constraints in the multi-well system that Diever-02 produces into, Vermilion's net incremental production increase from this well was limited to ~6 mmcf/d (1,000 boe/d), net to Vermilion. These are among the most successful wells VET has ever drilled in the Netherlands, where it is the second largest producer of natural gas.